Australians are delaying retirement by an average three years as cuts to the age pension and low interest rates force people to rethink their savings plans. A survey by research firm Roy Morgan conducted last October found that the average age of individuals planning to retire over the next 12 months was 61, up from 58 years of age two years ago. Roy Morgan industry communications director Norman Morris blamed the delay on the tightening of the eligibility criteria to qualify for a government pension and the introduction of a host of changes to the superannuation rules, which were announced in the 2016 budget, although they are not due to be introduced until July. The research company said economic uncertainty and low interest rates were also prompting individuals in their 50s and 60s to stay in the workforce for longer so they could save more. “Recent changes to superannuation rules and pension eligibility appear to be impacting on retirement age, with the result that people will retire later,” Mr Morris said. 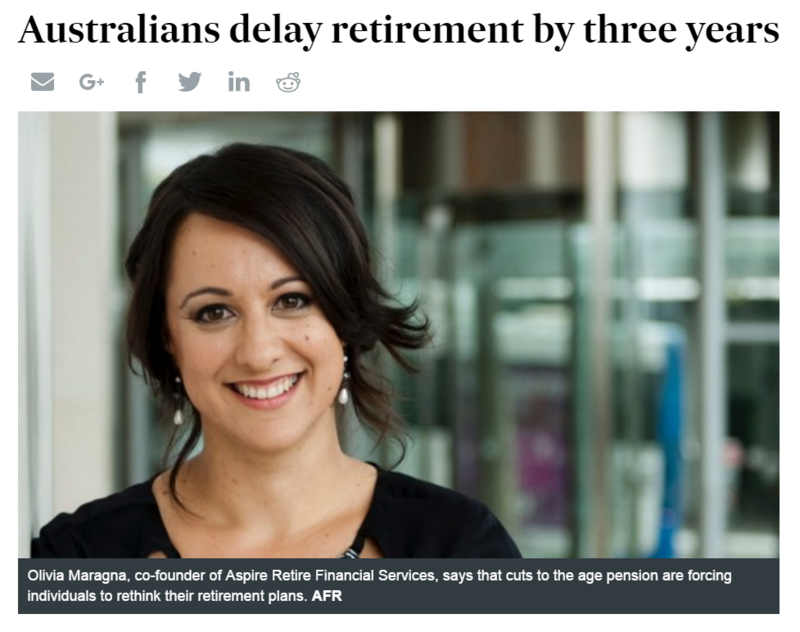 Olivia Maragna, co-founder of Aspire Retire Financial Services, agreed that cuts to the age pension were forcing individuals to rethink their retirement plans. “The changes to the age pension have rattled people quite a lot. People are starting to realise that the government is not going to support them,” Ms Maragna said, arguing that the government did not give individuals sufficient time to change their savings plans in response to the pension cuts, leaving them little choice but to work longer if they wanted to maintain their lifestyle in retirement. The pension changes were unveiled in the 2015 budget and introduced in January. Under the new regime, from January 1, the upper threshold for a couple who own their own home to receive a part pension has fallen to $816,000 from $1.2 million. For a single home owner the threshold has fallen to $542,000 from $794,000. The changes in the so-called taper rate have further hit part-pensioners. An individual’s pension has been reduced by $3 a fortnight, or $78 a year, for each extra $1000 in assessable assets. Previously the amount of pension fell by $1.50 for each extra $1000 of assets. As a result of the changes, 91,000 part-pensioners have been cut off entirely from claiming the age pension. Another 236,000 part-pensioners have had their payments reduced by an average of about $130 a fortnight. “If you were planning for retirement five years ago and then realised you were going to receive $10,000 less from the government than you thought, you might have to work for a few extra years,” Ms Maragna said. The executive also argued that low interest rates and the underperformance of sharemarkets after the global financial crisis, at least relative to expectations, had forced savers to delay retirement because their super balances were smaller than expected. “People are still feeling the effects of the GFC,” she said. Roy Morgan noted that super funds would benefit from delays to retirement plans because money would stay in the super system for longer. The government also stood to gain because the pension bill would be reduced.